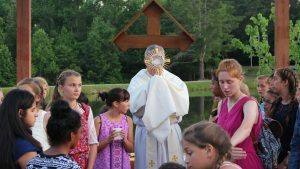 Challenge and ECYD Atlanta hosted another great summer camp for from June 10th- 16th, 2018 in Salem, SC. Seventy two girls from Georgia, Florida and the Carolinas participated in the camp. 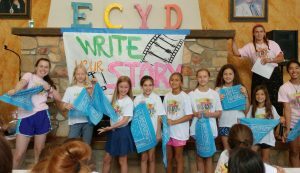 The overall theme of the Summer Camp was: “Write Your Story”, but the theme was adapted to the two different tracks to be able to better reach the girls were they were at. The great leadership team made this camp a huge success. Five phenomenal women were on staff to help run the camp. The moms were key players in the overall well being of the campers and made sure that the campers had a great time. Melissa Foley, mom of 2 campers, helped to lead the team leader track, helping to give some of the formation talks and being such a great mentor to several girls whom approached her to talk. We had two of our club presidents present, Denise Madgey and Karen Donnelly. We were blessed with having Mary Drapeau and her daughter Mimi as the nurses. We also had 3 three Regnum Christi missionaries who helped running the campaign, oversee the sports, night activities and overall spirit of the camp . Three consecrated women were present as well for the accompaniment of all the girls who came to the camp. We had twenty awesome team leaders. They were the main protagonists of the summer camp, giving most of the formation blocks and helping run and lead different activities that made the camp possible! Best night activity: Chumpy Churry Match, an activity that involves several minute-to-win-it type of activities. It breaks the ice among the girls, being an activity of competition, team building and laughter all the time. Best conference: The girls really enjoyed a talk given by one of our senior team leaders. The theme was: “I don’t know what your plan is but I know it’s good”. The objective was that the girls realized that God wrote the script in their heart through their desires, dreams and wishes and He has the plan to fulfill them so that their story is beautiful. He is the best director because He accompanies them and gives them tools to help them improve: the sacraments, prayer, good friends, ECYD etc. The girls are given an impossible task that they can’t do on their own, but then they are allowed to work as team to discover that with help they can do it. Best spiritual moment of grace: Eucharistic Procession. All the girls were able to make or renew their ECYD pledge of friendship at the end of the procession which ended in front of the lake with a Bonfire! The friendship some of these girls were able to make was beautiful! Some old friends from school or from previous camps were so open and ready to make new friends! We are looking forward to do it all over again and give the team leaders a chance to shine one more time as they did this year.